It's time for another No Croutons Required roundup, with 12 delicious recipes contributed from across the world. 12 delicious soups and salads that would make a wonderfully light evening meal. Soups. Now it's getting cooler, soups are an ideal meal. They are easy to make and a great way of using up seasonal vegetables. Just add some crusty bread for a heartier meal. 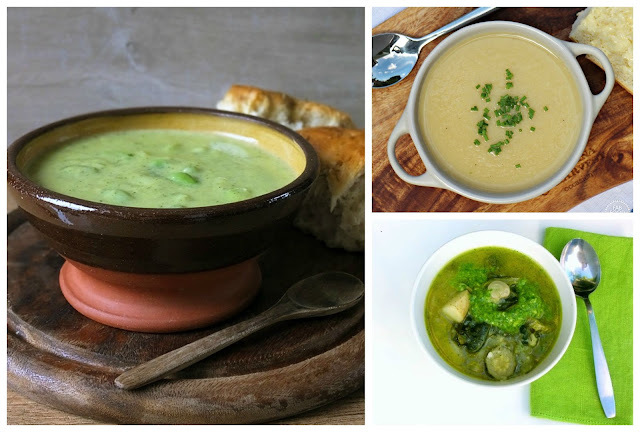 Our first soup (on the left, let's go clockwise) is a Broad Bean and Courgette Soup with Gouda from Elizabeth's Kitchen Diary. Elizabeth has a veg box delivered every Friday. Her Friday meal is a usually a spread of finger food with crusty bread and salad from the box, but she also likes making soup and so she created this delight with her broad beans and some leftover Gouda. Camilla from Fab Food 4 All is a dab hand at getting bargains at her local supermarket. This time she came home with a 1p, yes 1p celeriac. Once she was home she had to decide what to do with it. After a chat with online friends she decided to roast it with garlic and make this creamy Roasted Celeriac Soup flavoured with a little lemon juice. Choclette from Tin and Thyme also brought us soup. A very green soup, in fact a Summer Minestrone. This soup also contains broad beans, but this one is paired with courgette, spinach, peas and potatoes to make it more substantial. Cooper turned his nose up at my green soup last night. Potatoes may have made a difference. Noted! 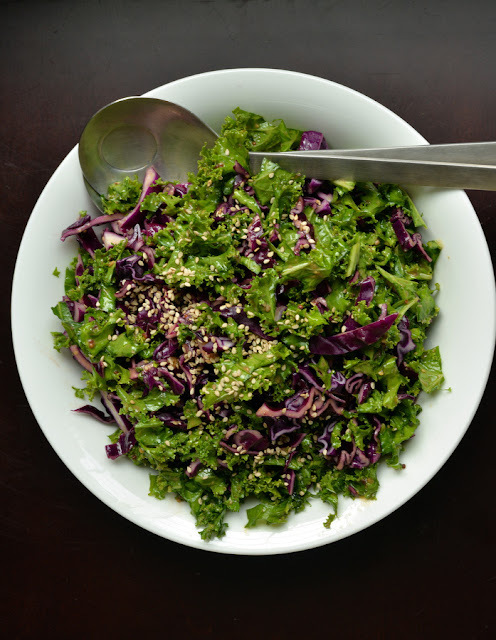 For all the kale lovers out there, a Maple-Miso Kale and Cabbage Salad from The Taste Space. Janet made this salad for friends who were visiting from Hong Kong and were craving kale. She teamed it with red cabbage, which was new to them and a fusion Asian dressing. It got rave reviews. TIP: remember to massage your kale folks! 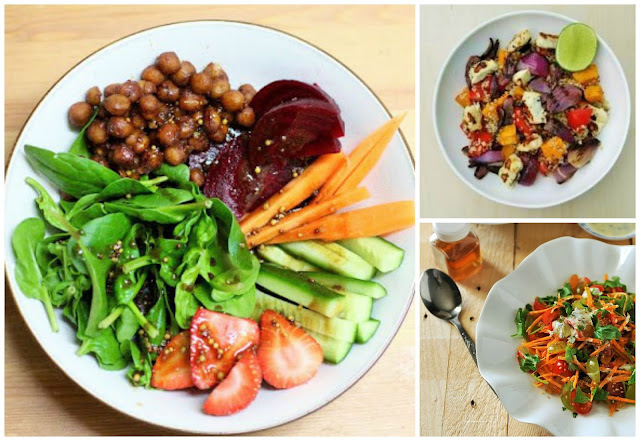 Eat the rainbow with these colourful salads. The first salad is a Greek Orzo Salad from Linzi from Lancashire Food. This salad is based on the memory of a wonderful holiday to Greece many years ago. Orzo pasta with tomatoes, cucumber, feta, cucumber and a gorgeous dressing. Shaheen from Allotment 2 Kitchen brings us a Beetroot Potato Salad. Sick of mayo laden potato salad? Then this is the one for you. Shaheen made a beetroot relish, which is super simple to make and mix it with potatoes to make this colourful side dish. My good friend Lisa from Lisa's Kitchen is up next with this Vegan Caesar Salad. I've tried Lisa's Caesar dressing before and I can confirm that it's super tasty. This is a good reminder to make it again soon. Lisa teams kale, salad leaves and croutons with this unctuous dressing. I don't know about you but I love potato salad. Helen does too, but noticed how much mayo she was getting through, so she decided to cut the calories, but keep the luxurious creamy flavour. 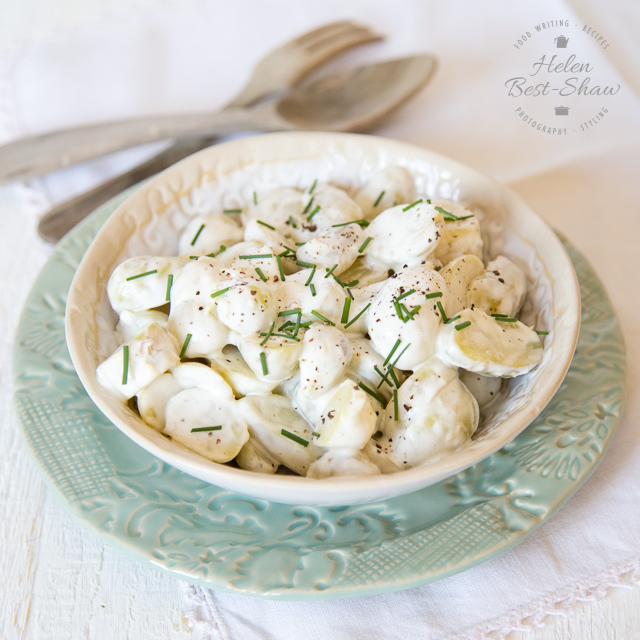 Pop over to Fuss Free Flavours for this Healthy Potato Salad recipe. I recently made this Warm Tenderstem and Samphire Bulgur Salad and it was delicious. I love tenderstem and the salty taste of samphire worked really well in the salad which I perked up with fresh herbs. I also got as much flavour as I could into the bulgur wheat while I was cooking it. This is one tasty salad. allows you to eat a wide range of nutrients, which is great for your health. We've reached the final three. The first is the most beautiful Strawberry Chickpea Salad from my Johanna over at Green Gourmet Giraffe. I love the way Johanna has laid out her salad. It's like a buffet on a plate and so appealing, I just want to dive in. Next up is a Freekeh and Quinoa Salad with Roasted Squash and Halloumi from MintCustard. I don't know about you, but Becky had me at Halloumi! A super tasty salad. I've not tried Freekeh yet, so this is another reminder to give it a try. The last salad is a carrot salad, but not a simple carrot salad, oh no a Spiced Carrot and Raisin Salad from Flavours and Tastes. Carrots, tomatoes, grapes and raisins all coated in a delicious dressing. A great way to finish off this roundup. 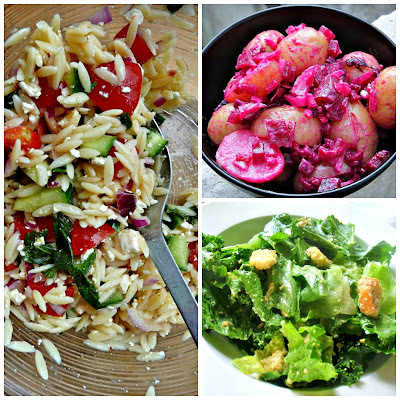 I hope you enjoyed these soups and salads and are inspired to try some of them. Lisa is hosting the September edition of No Croutons Required, so if you're a blogger, head over there and join in. For my readers, the next roundup will be on Lisa's Kitchen at the end of September. Great post - I've been looking for some quick and easy ideas bow the kids are back at school and the evenings are so busy! Yes they definitely are. Glad you left inspired Nadia. 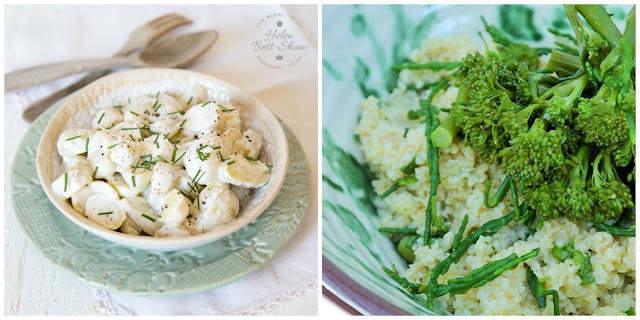 lovely write up jac - so much good food here - glad you enjoyed the way I set out the salad - am quite inspired by pinterest bowls and want to try this sort of style more! I thought it looked fab Johanna. I just wanted to dive in. So colourful and appealing. Beetroot makes every meal look fantastic!